This is a layout under construction. Started in 2014, Helstowe will be the new OO layout built by club members on Tuesday club nights. The base boards are complete, track is laid and the electrics are nearing completion. The layout is not being designed for any particular period or region; this will allow club members to bring their own RTR stock to run on the layout. The layout comprises seven boards each 4' x 2' in an end-to-end shunting type configuration, making the overall size is 28' x 2'. The rail is Peco code 100 with live frog points and Tortoise point motors. There is a Heljan turntable. Helstowe is a fictional place in the south of England. No particular era has been modelled as this will enable members to run their own stock whether it be diesel or steam locomotives. The layout is in OO gauge and boasts three stations: Helstowe, Medway and Medway Quay. It has an up and down main line with a branch line with third rail capacity to allow running of electric stock. With regard to traffic, passengers can travel to and from Helstowe with some trains stopping at the intermediate station Medway prior to continuing on the main line. Freight is also handled through Helstowe before continuing on to the Medford Quay for loading onto ships for a further journey by sea. There are many running possibilities with this ambitious layout and club members are taking a keen interest in its progress. 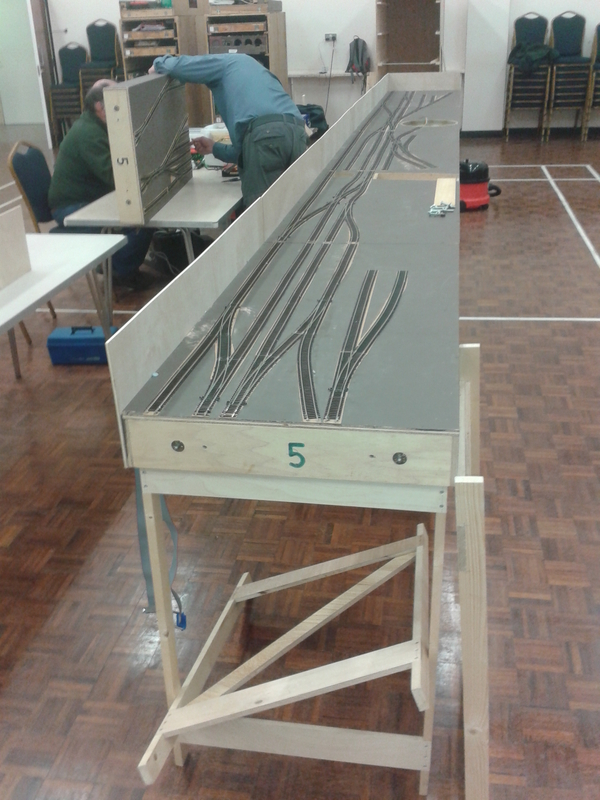 The layout structure is built, track laid and electrics installed and being commissioned. We will post some photographs very soon to show the progress on this ambitious layout.